A few people have asked if there are really "close to 20" empty shops in Worcester Park High Street which is what I said to Theresa Villiers MP when she came to visit. 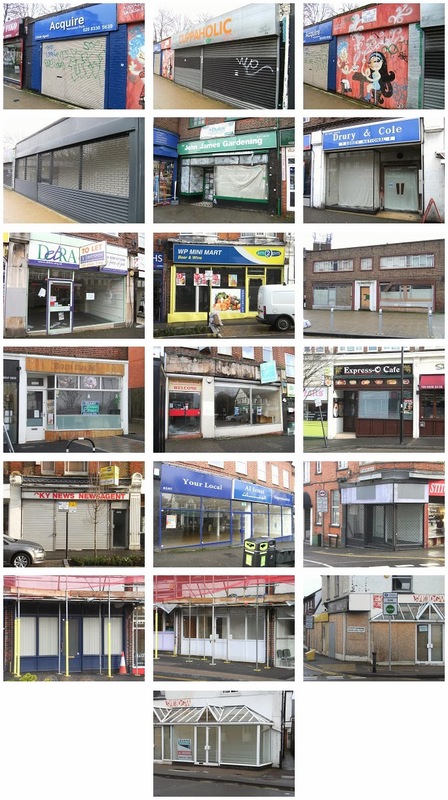 By way of explanation, here are photos of 19 commercial properties on or just off the High Street (Central Road plus a bit of Cheam Common Road) from the station up to (and including) where the Vin Bin used to be. Admittedly there are various reasons for why these premises are currently not open for business but the fact is none of these are currently trading. For anyone interested in how things have changed over the last few years, a Sutton "Vacant Property Report" back in September 2010 stated that (at that time) there were 10 vacant properties in Worcester Park. Thanks to blog reader Richard for his help with this. This is a bleak collection of photos. However we have great many good businesses trading in Worcester Park. It's important to remember that and that we need to support them if we want them to still be there next time we need them. I believe the old 'Station Florist' is soon to open as a plumbing a heating supplies shop so that's one less. The Worcester Park Traders Association is working on some ideas to promote the benefits of Worcester Park High Street too, especially to local shoppers who might sometimes go further afield to shop. Hopefully I will have more on that soon. In the meanwhile - use your local shops or lose them. And hopefully when new businesses do open, they will compliment the high street (like I believe one recent new addition has) and bring in more business for all the local traders.